If this doesn't evoke childhood memories, I don't know what will: Betty Crocker's "Create-A-Bug", Fruit by the Foot, Fruit Roll-Ups, and Gushers are now all labeled gluten free! That picture is unfortunately from an old box; the new boxes prominently display "Gluten Free" on their fronts. Even better than this news is the news that MyBlogSpark has offered to do a giveaway to my readers! 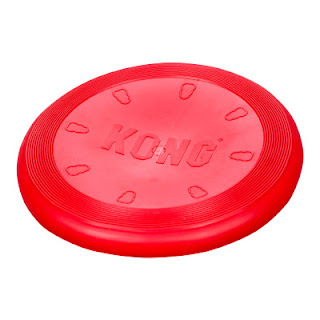 They will be giving away one box of Create-A-Bug gummies, one variety box containing Fruit Roll-Ups, Fruit by the Foot, and Gushers, a classic frisbee, light up yo-yo, and pick up sticks. How do you enter? Just leave a comment on this blog entry with your favorite gluten free childhood snack. If your favorite childhood snack was not gluten free, how would you eat it now in a gluten free way? I'll draw all of the entries randomly on October 10th, '09. Unfortunately, this contest is only open to those in the contiguous 48 states -- those are MyBlogSpark's rules, not mine! Today my friend Hilary and I went to Xooro to indulge in some churros to celebrate her birthday. Unfortunately, the nearby West Hollywood location didn't have gluten free churros. She picked me up and we drove over to the Santa Monica location; I've been telling Hilary about the churros for months so we were very excited as we walked down Broadway to finally have them. Little did we know that Xooro in Santa Monica is closed on Mondays! As we dejectedly walked back to the car, we squabbled over what treats we wanted. Millions of Milkshakes? Yogurt Stop? Hugo's? Real Food Daily? We had some tough decisions to make but ultimately ended up headed to Real Food Daily's West Hollywood adjacent location on La Cienega. I've written about Real Food Daily before (here) and was really excited to check out the new menu, which lists certain options as wheat and gluten free. The entire restaurant is vegan and, to my knowledge, is one of the premiere vegan places in L.A. Correct me if I'm wrong, vegans! As Hilary and I perused the menu, we settled on splitting our lunches to maximize the variety of flavors. 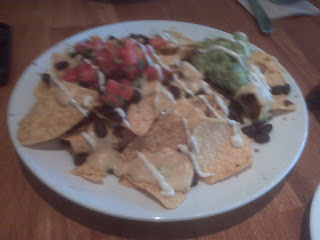 We started with the Not-chos, which came smothered in vegan cheese, fresh guacamole, black beans, pico de gallo and tofu sour cream. Please excuse the poor picture quality -- my cell phone camera is no good. The nachos were awesome! 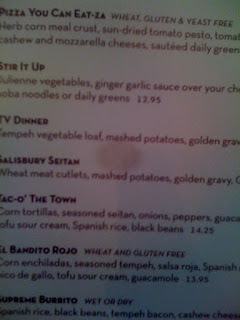 The waitress told me they aren't marked on the menu as gluten free because of the taco mix which can be added to them. We steered clear of the taco mix and had this enormous portion as our appetizer. The guacamole was my favorite part, as it was really fresh and creamy. We ordered the chips with the Jalapeño cheese, which the waitress told us was only a little spicy. I'm not sure what her definition of spicy is, but Hilary and I were left begging for more water! For our entrées we ordered El Bandito Rojo and Pizza You Can Eat-Za. We learned from our spicy mistake in ordering the jalapeño cheese and opted for the normal cashew cheese. When we were served our entrées, our jaws practically dropped. We were both feeling pretty full after the not-chos and weren't expecting there to be such enormous portions. Regardless, we both started noshing on the pizza and were really happy with the way it tasted. It wasn't a pizza that you could pick up and eat but instead required a fork and knife. The crust was thin and crispy and consisted of a rice and polenta mix. 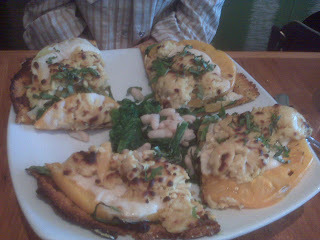 The pizza was stacked with great flavors -- heirloom tomatoes, vegan cheese, sautéed greens, sun-dried tomato pesto and more. I went nuts for the pizza because of the unique crust. The pizza was certainly not trying to imitate gluten filled pizza (or a pepperoni pizza, for that matter) and it was very successful in being delicious in its own rights. 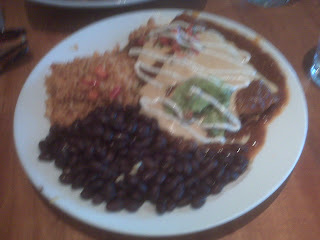 We capped the meal off by biting into our Bandito Rojo. I've had this dish before when I went to RFD with my old roommate Vanessa, but I didn't remember it being as good as it was. The dish was served up with soy tempeh, fresh guacamole, black beans, and delicious rice. The dish was good, but not as outstanding as the pizza. The pizza's fresh and unique flavors, along with the fresh tasting not-chos, put the meal over the top into the excellent category. They practically had to roll us out of the restaurant when we were finished eating all of this awesome gluten free food. Luckily, my friend Justin's shift started right as we were leaving so I was able to see him in his native RFD habitat. I haven't checked out this branch for myself yet, but for you eastsiders The Counter has now opened in Pasadena. 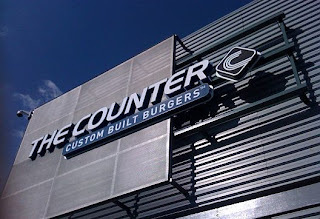 Serving awesome and fully customizable burgers, The Counter has a checklist which details their gluten free items. Click here for my in-depth post about the chain's Santa Monica location. Did Khloe Kardashian Order a Gluten Free Wedding Cake? According to a People.com article, the wedding cake served at Khloe Kardashian's wedding today was made by none other than Hansen's Cakes. Hansen's makes gluten free wedding cakes (and cupcakes) that are available by special order. I wonder if Khloe ordered her wedding cake gluten free? UPDATE: According to Hansen's Cakes official blog, the wedding cake was NOT gluten free. Oh well -- good to know that Hansen's Cakes is delicious enough for high-profile celeb weddings! My friend Adam texted me months ago and told me that Lucifer's, a pizza place by his apartment in Los Feliz, serves gluten free pizza. Adam is always traveling for interviews -- jobs, fellowships, clerkships. The boy never stops. Luckily we were finally able to meet up and check out Lucifer's today. My friend and I ordered (I got the Chicken Basil Pesto on gluten free crust; Adam ordered BBQ Chicken & Bacon) and I was pleasantly surprised by the low cost -- my personal pizza was only $11. If you've read my Pizza Fusion post, you know that my biggest gripe about pizza here in L.A. is the price. When I recently visited New York City and ate at Mozzarelli's I realized that I was spoiled by the awesome, by-the-slice gluten free pizza there. At Lucifer's I was happy that my wallet wasn't being emptied by a single pizza. After an almost interminable wait (it seems that only one person was working on the Sunday that my friend and I went), our pizza was ready and we headed back to Adam's place to eat lunch. The pizza was good, but not great -- especially with such a long wait. Maybe it was just a fluke today, but even when the pizza was served after the long wait it still didn't seem completely warm. The crust was okay; it wasn't paper thing but it also wasn't as thick as a gluten filled crust would be. I did enjoy the toppings on my Chicken Basil Pesto, particularly the cashews that were added to it. However, it didn't taste as fresh as I would have liked... instead, it tasted a little like leftover pizza (even thought it wasn't). I may give Lucifer's another go to see if it was a fluke, because I think that some of the flavors the restaurant were serving were unique and hard to find at other gluten free pizza places. 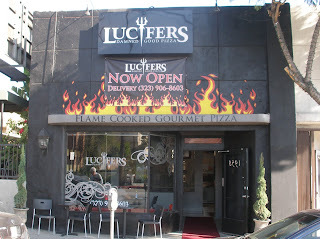 Lucifer's may be a good option for Celiacs who live in "east" LA and are looking for some gluten free pizza; being served lukewarm pizza and the hell theme threw me off. For anybody on the Westside, Lucifer's is not worth the trek, particularly with other options like Pizza Fusion, ZPizza, Fresh Brothers, and Deano's so close. With this being my virgin post on Gluten Freeways I’ll introduce myself – I’m Alison, a college friend of Stephen’s who joined him as a Celiac in January. Though I am not lucky enough to live in sunny California, I really enjoy his blog and am ecstatic to be contributing some GF reconnaissance from Boston. 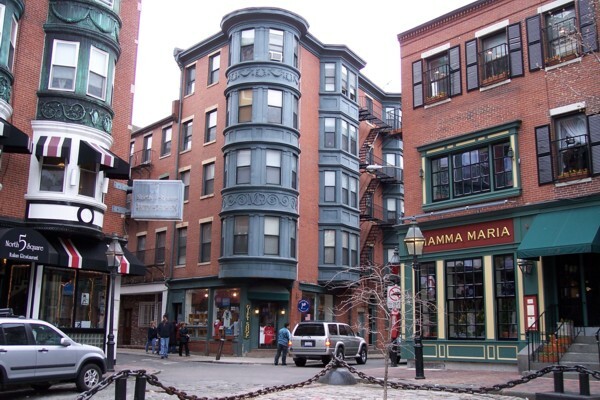 After my diagnosis, I essentially shunned the North End. A haven to all things glutinous – pasta, cannolis, and garlic bread – it seemed as though I’d never again experience gustatory pleasure in this historic neighborhood. Then my friend Miranda brought Nebo to my attention. She saw it advertised as having a GF menu and promised we would go. 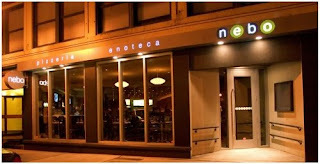 Looking forward to our Friday night reservation helped coax along an otherwise tiring week. 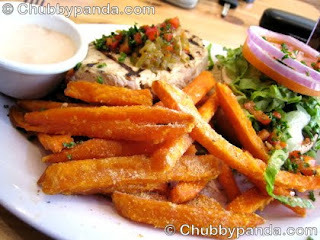 Miranda, another college friend and I decided to order a number of items from the GF menu and share them all. The selection was impressive with a wide array of appetizers, salads, pastas, and pizzas to choose from. We settled on two appetizers and two pizzas. Starting off with a shrimp and polenta dish proved a great choice. 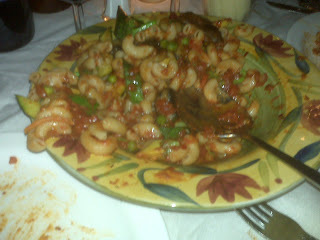 The shrimp were cooked to perfection and the polenta practically melted in your mouth. Though I’ve used polenta in my home cooking, I have been unable to masterfully prepare this corn concoction. A caprese salad quenched our cheese and tomato cravings. Next came Nebo’s true test as we were served our pizzas. Out of a diverse variety of topping combinations we chose one featuring artichoke hearts and fresh ricotta and another with goat cheese, pepperoni, and arugula. Visually they weren’t too impressive, but one bite confirmed Nebo knew GF pizza crust. It balanced crunchy and chewy with a hint of sweetness. My friend Mel insisted it could double as a pie crust! The toppings themselves weren’t anything to write home about and were a bit overshadowed by a liberal application of cheese. Another disappointment was the $4 surcharge for the GF crust, resulting in each pie running around $20. I would also recommend being very clear with your server about dietary restrictions; if we hadn’t reminded our waiter I think we would have unknowingly ended up with regular crusts! Our dinner at Nebo was enjoyable, if not spectacular. 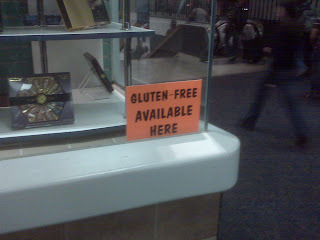 It’s great to know there is an option for Celiacs in the North End. Babycakes, an awesome New York gluten free bakery coming soon to Los Angeles, was recently featured on Gwyneth Paltrow's strangely titled Goop newsletter. Check it out here; there is an interview with Erin McKenna and three recipes. 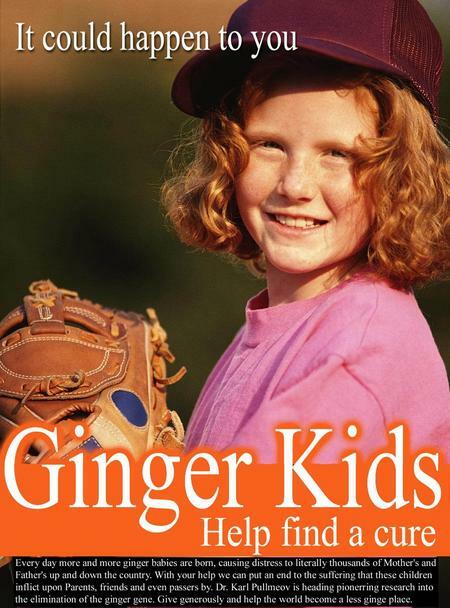 Thanks to Sarah and Allison for the heads up. Do you love it or do you love it? The full Babycakes book is available here on amazon.com. Coming soon to Downtown L.A. I haven't been able to check out either of Veggie Grill's two Irvine locations for myself, but my friend Sarah passed along the info that the menu prompts eaters to inquire about gluten free options. After scouring the website, I found a gluten free menu! 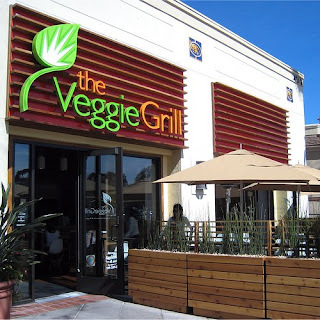 In even better news, Veggie Grill is soon coming to L.A. It is slated to open September 29th near West Hollywood. Hi All! 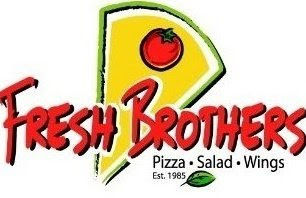 I have some exciting news -- Fresh Brothers in L.A.'s South Bay recently reached out to me to hold a gluten free tasting for my readers. We've set up the date as Saturday, October 17th @ 11:30am. It will definitely be a great lunch. Unfortunately space is limited, so I have not provided the full information on this post. Please e-mail me at glutenfreewayLA@gmail.com if you would like to attend. In that e-mail please include: your preferred e-mail address, number in your party, and your favorite gluten free place in L.A. Looking forward to meeting and eating! I recently received a book to test out, "Gluten-Free with Love." I decided to choose the simplest recipe I could find -- the Peanut Butter Cookies. I tried them once on my own with stevia powder...and quickly realized I was very mistaken!! I have never baked with stevia before so I didn't know which kind to buy. Whoops. When I went home, I offered my mother and sister the positions as my sous chefs...and they gladly made me sous chef. I was allowed to do the bare minimum of work. We started off with a few stolen stevia packets from our local, gluten free friendly grocery store, Peter's Cornucopia. Stevia isn't an ingredient often used in my house, so we decided to swipe some, figuring that we were regular customers so it was okay. Don't arrest me! The recipe for the Peanut Butter Cookie is very simple apart from the stevia; it requires stevia, an egg, and all natural creamy peanut butter. As per the recipe, we mixed together the three ingredients and shaped them into small balls. Then we placed the balls onto an ungreased cookie sheet and about 10 minutes later, we had our Peanut Butter Cookies! I was really eager to try the cookies after my previous failed experiment. After we let them cool, we bit in. The cookies were OK; they didn't explode with peanut butter flavor, as I would have expected them to since we used a substantial amount of it. The cookies were also very crumbly and dry -- I paired them with a tall glass of chocolate Silk but it didn't help me enjoy the cookies more. After our so-so time with the Peanut Butter Cookies, we looked through the recipe book to choose another recipe to prepare from the cookbook. On my own, I decided to try the Cashew Butter Cookies (without the same terrible stevia that was my fault in purchasing). My experience with the Cashew Butter Cookie was similar to my experience with the Peanut Butter Cookies. Many of the other recipes (i.e. in the book were naturally gluten free, and were not changed to be gluten free. I appreciated that the peanut butter and cashew butter cookies were simple to put together, but I didn't love the flavors of either of them. Pizza Fusion recently opened two locations in the great Los Angeles area; one is located in Santa Monica, in the same plaza as The Counter, while the other is just east of the border of West Hollywood and Los Angeles. I visited the Hollywood location because it is super close to my apartment. When I arrived I was pleasantly surprised. I've visited Pizza Fusion in Florida before at its North Miami Beach location, and it was more of a pizza joint then a restaurant. The Hollywood location is definitely a restaurant; the decor is simple and clean. The restaurant is located right next to the big Trader Joe's, CB2, and Crunch complex at Crescent Heights and Sunset. I looked over the menu for a bit and suddenly remembered my gripe about Pizza Fusion in Florida -- the expense. The signature pizzas vary in price (I believe the cheapest was $13.99 while the most expensive was $18.99). However, you cannot get a gluten free pizza in a personal size or by the slice. Instead, you must order a large if you want it gluten free. 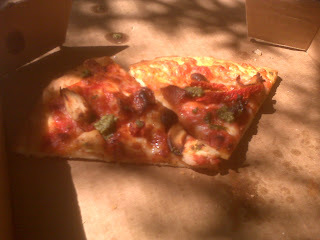 I ordered the Four Cheese & Sundried Tomato pizza gluten free; it amounted to $28! That is a lot for a pizza -- I voiced my frustration to the Manager that gluten free pizza is not available by the slice. You can also build your own pizza, at an even greater cost. The gluten free crust begins at $18.99 without anything added to it! If you add anything to it, the price will be even steeper. Maybe I'm spoiled after my frequent visits to Mozzarelli's, which offers pizza by the slice, but the cost of Pizza Fusion was overwhelming. 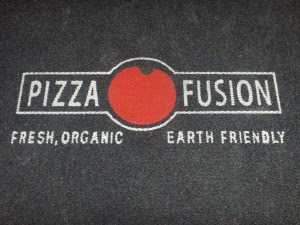 To its credit, Pizza Fusion almost exclusively uses organic, all-natural ingredients. 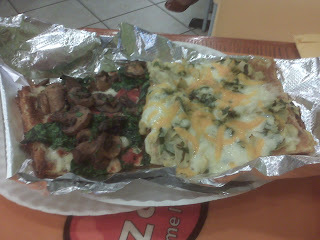 But about the pizza itself -- it was a thin crust, a bit thicker than ZPizza's. The flavor didn't really pop for me like Mozzarelli's or Fresh Brother's flavors did. Instead, the four cheese pizza was a bit bland. I spoke to my friend Alex who I visited the Florida location with and she remembers having the same sentiment when we ate at Pizza Fusion there. Maybe I ordered incorrectly; I will definitely check out the Santa Monica location and order something different next time to see if I have a different experience. As far as L.A. pizza goes, Pizza Fusion won't be my go to stop. Pizza Fusion is a great option if you are eating gluten free with a group of people, but if you are looking for a small personal pizza definitely steer clear. In a related post, if you need something to jam to while frosting your Babycakes cupcakes, blast the video below and rock out. 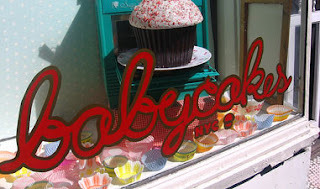 BabyCakes NYC: Frosting Party! from BabyCakes NYC on Vimeo. Do you love it or do you love it? The cookbook is available here on amazon.com. Erin McKenna, owner of Babycakes (coming soon to Los Angeles! ), stopped by Martha Stewart after the release of her cookbook. The videos were recently put up on YouTube and are posted in the "More" section. The cookbook is available here on Amazon. Update: A recent comment notes that not all Ragu sauces are gluten free anymore. Always be sure to check every product label before purchasing (and eating!). 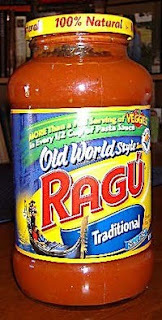 Great news -- all of Ragu's sauces are gluten free! I called today because I was interested in using some of their products, and the people were very helpful. They also said that all Unilever products will mark any gluten in them explicitly. I've done my fair share of gluten free Italian eating in New York City, and I was surprised to learn of a restaurant called Bistango. I had never heard of the restaurant, but I found out that it made almost everything on its menu gluten free in a dedicated gluten free area of its kitchen. I knew that I had to try this place out, so I met up with my parents and friends and we headed to Bistango. When I sat down the waiter asked the table if anybody had any allergies or dietary restrictions. I told him of my need for gluten free food, and was pleasantly surprised to hear that everything on the menu save for the Ravioli could be made gluten free. Even better, the waiter brought me out two delicious slice of gluten free bread while everybody else snacked on their gluten filled bread. As far as gluten free bread goes, this was some of the best I've ever had. It's been so long that I've had bread in an Italian restaurant (let alone pasta) that I was perhaps overexcited about the bread brought to me. It was difficult to choose from the menu, because everything looked so good! For my appetizer I chose a simple dish, Caprese con Basilico. Normally Caprese salads are gluten free, so I didn't think much had to be changed to prepare the dish. 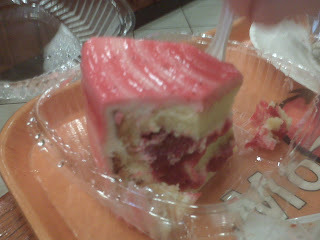 Once it was brought out, I immediately dug in -- I hadn't eaten in hours and was starving. The mozzarella that the restaurant used tasted fresh and was well-sliced, not too thin and not too thick. For my entrée I went with the Capellini con Gamberetti e Carciofini. It was terrific! While it wasn't made with angel hair spaghetti, I wasn't disappointed in the dish. The portion sizes were great; they were so great in fact that at the end of the meal my table let out a collective exhale because we were all so full! My friends also ordered two gluten free dishes so that we could all share. Jon ordered the Mezza Rigatoni alla Ragu, while Elien ordered the Pennete al Pomodoro con Melanzane. Both were awesomely delicious, although I preferred my dish. I'm a shrimp fan, and the shrimp were cooked to perfection. I spoke to the owner after I ate dinner to learn about why Bistango started offering gluten free options. He said that the Celiac community in New York had requested it from him, and that he had been making it because of them. He was extremely nice and wanted to know every detail of what I thought about the food. 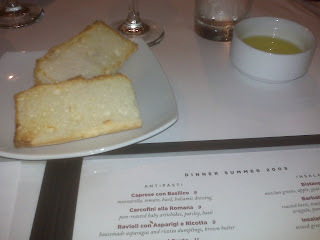 Bistango is a great choice for Italian food in New York City -- I will definitely go back on my next sojourn to Manhattan. Check back soon for two more posts about gluten free Italian places in NYC. PHEW! I'm finally back in Los Angeles after an extended vacation. Over Labor Day I went to Colorado (check out this post about Larkburger, a great gluten free place in Vail, CO); I flew back to L.A. on Monday and on Tuesday I flew out for New York City. It was quite a frantic schedule so excuse the lack of posts. 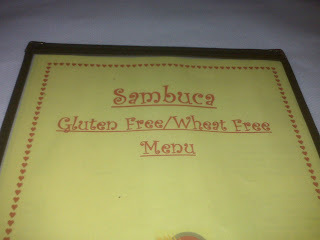 Luckily while I was in NYC I hit up a few of my favorite gluten free spots! As I was leaving LAX, I saw this sign in one of the candy shops. I was flying JetBlue and was all the way at the end of the terminal (I forget my gate, sorry!). Unfortunately I was late for my flight so I wasn't able to inquire about the GF options. Do any of YOU have information about this shop? Have you seen this sign? I'm not sure when I will be flying again next, but I will certainly check it out when I am! I landed in NYC extremely early on Wednesday morning and hopped in a cab to my friend's apartment. I hit the bed pretty quickly and made up for the sleep I lost on the flight. When I woke up, I felt hunger pains for Mozzarelli's. I made my way down to 23rd & Park and couldn't resist over-indulging myself in the awesome Mozzarelli's slices. All in all, it was a pretty successful afternoon. I'll have more posts coming about two new gluten free restaurants in New York City this week! 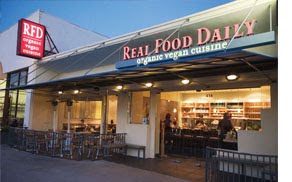 Real Food Daily, an awesome vegan restaurant in West Hollywood, now has a menu that marks gluten free options! The Pizza You Can Eat-Za looks great. I've had the Bandito Rojo before and it was awesome. I've been to RFD before and loved it, but haven't checked out the new menu. I'll do a full review later! Thanks to Vanessa for the heads-up on the new menu. Note that the new menu may not have launched at the restaurant's Santa Monica location yet; please call ahead for details. The Sensitive Baker, one of my favorite gluten free bakeries in L.A., is for sale. But don't worry -- hopefully this doesn't mean it's closing. On The Sensitive Baker's blog, the owner Sandy (a wonderful woman who is always super friendly and helpful when I drop by) has provided some answers to frequently asked questions about the sale of the bakery. On those FAQs Sandy assures her readers that the store will not close. I'm crossing my fingers tightly that it doesn't -- the bakery is awesome and is 100% gluten free (and even has some vegan treats). My personal favorite are the bagels and cupcakes, both of which are awesome. Luckily we have Babycakes opening soon (last I heard it was late November, but nothing is firm yet), so just in case The Sensitive Baker does close we have that to look forward to! I've written about Maria's Italian Kitchen Downtown previously (check it out here) but had never been to the restaurant myself. My friend Dana recommended Maria's to me after she noticed that one of the options on the menu was marked "gluten free." Now that I'm in my second year of law school, I can breathe a bit easier and relax. My lunch breaks are longer, the reading isn't quite as dense -- life is altogether better. Maria's is also now offering a full gluten free menu, and with the decreased study time needed for school, I thought it would be a good time to check it out for myself. As we entered Maria's, we were greeted by a very friendly hostess. She supplied me with the restaurant's gluten free menu and was told me to advise the waiter that I would be ordering gluten free. 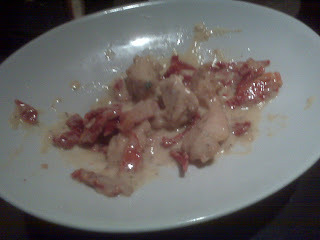 My friend Hilary offered to eat gluten free with me, so we ordered the Pomodoro Risotto and Santa Rosa Chicken. 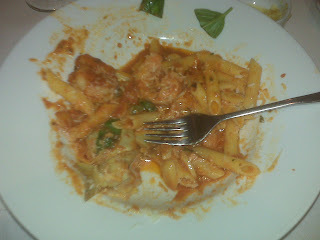 After ordering, the waiter asked us whether we wanted pasta with those dishes, to which I heartily answered "No! We are gluten free!" He said it was his first time dealing with gluten free, so my friend and I reminded him that on the menu it says to request mashed potatoes instead of pasta. While we waited the server brought us bread and knew enough to put it on Hilary's side of the table. For any gluten eating readers out there, she said the bread was delicious. Hopefully they can come up with a gluten free bread that is also delicious, because it looked great! When our food was served, we were a bit confused. The chicken came out and it was...interesting. It seemed like we had just ordered from P.F. Chang's, as the chicken was cubed and not a breast. We were both confused - is this how non-gluten free chicken is also served? The plate had about 6 pieces of the cubed chicken on it. When we looked around the room, the other diners' portions looked enormous. Apart from its size, the chicken was just OK. Frankly, it is a good thing that I am a lifeguard because the chicken was drowning in the sauce it was served in. The sauce was not especially flavorful and altogether bland. Even stranger, a few minutes after our chicken was served our waiter brought us our Pomodoro. However, it was Pomodoro...without the risotto. It was just Pomodoro sauce. Granted it was our waiter's first time working with the gluten free menu, but if the restaurant is providing such a menu it should train its staff to be knowledgeable about gluten free options. When we explained that we had ordered the Pomodoro Risotto he looked generally confused and said, "But you can't have the pasta." Once I explained that the risotto was gluten free (and on the gluten free menu! 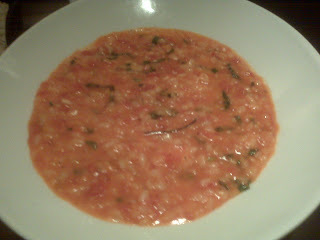 ), he fixed the mistake and brought us out some piping hot Pomodoro risotto. The risotto was good, not great. Like the chicken, it was swimming in a not particularly flavorful sauce. Overall, it was OK, but not great. Another mystery soon presented itself -- our waiter brought us over one side of mashed potatoes and told us that they used flour to make the mashed potatoes. This despite the fact that on the gluten free menu it says to ask for mashed potatoes instead of a side of pasta. Regardless I was happy to be warned of the mashed potatoes' gluten factor before digging in. My friend and I risked our luck and ordered the gluten free flourless chocolate cake. This was one part of the meal that did not disappoint. 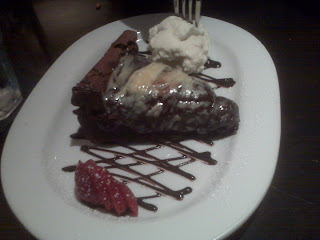 The flourless chocolatecake was awesome; it was fluffy and light. I've often found that flourless chocolate cakes are hard or too thick. Maria's flourless chocolate cake is definitely one of the best I've had. Overall, I can't say I enjoyed the meal. The chicken was too sauced (and cubed!) to enjoy, and the risotto was just OK. 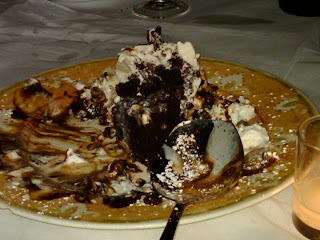 The one thing to check out Maria's for is the flourless chocolate cake! Welcome to the September 1, 2009 edition of the Gluten Free Lifestyle Blog Carnival, a monthly blog carnival. Last month's was held over at The Food Allergy Coach. Cheryl Bannon introduces the Best way to Fry Gluten Free posted at my realistic life, giving great advice about how to fry safely for Celiacs. Tamara Duker presents Fun with Chickpea Flour posted at What I'm Eating Now, saying, "Typical GF "flours" like rice flour or tapioca starch are high in carbohydrate but offer little by way of nutritional value. Chickpea flour, however, is a high-fiber, high-protein and high-iron flour alternative. Once you try these fast, easy, filling and nutritious recipes featuring chickpea flour, it will become a pantry staple in your house for sure!" Kim, The Food Allergy Coach presents Flourless Pancakes! posted at The Food Allergy Coach, giving Celiacs "Light, fluffy, and delicious" pancakes so good that "you won't miss the flour!" Ali from Whole Life Nutrition presents Gluten-Free Whole Grain Waffle Recipe posted at The Whole Life Nutrition Kitchen, saying, "A delicious gluten-free, dairy-free whole grain waffle recipe. Makes a large batch, leftovers can be frozen and reheated in a toaster or toaster oven. Enjoy! :)"
Linda Simon presents U is for Upside Down Cake posted at Kitchen Therapya great recipe for gluten free Upside Down Cake. Katrina Morales screams posted at Gluten Free Gidgetfor gluten free/dairy free ice cream! Cain Credicott presents Gluten-free, Dairy-free, Egg-free Oatmeal Jam Bars posted at Theceliacmaniac.com. Ginger Carter Miller presents a great list of gluten free treats for you posted at Gluten Free in Georgia (and Florida). Gluten Freeways presents a review of Mozzarelli's in New York City, an awesome pizza place in Manhattan that offers great gluten free pizza, pasta, and dessert. Cain Credicott introduces a new Turtle Mountain product, posted at Theceliacmaniac.com. Mariano DiFabio introduces a book soon to be released: The Gluten-Free Guide To Washington, DC posted at Avelient BioPharm Blogoffering resources for Celiacs in the D.C. area. Kim, The Food Allergy Coach presents Ask the Coach: What exactly is personal coaching? posted at The Food Allergy Coach"Overwhelmed by the gluten free lifestyle? Personal coaching might be for you." Nancy Lapid presents The Food Allergen Labeling and Consumer Protection Act: What It Means for Gluten-Free Food Shopping posted at About.com Celiac Disease. This post provides helpful information about current and future labeling laws. The Gluten Free Lifestyle Blog Carnival, being hosted on October 1st by Katrina at Gluten Free Gidget,using our carnival submission form. Past posts and future hosts can be found on our blog carnival index page.